Police in Lae today confiscated a large number of explosives from a company premises in East Taraka who closed down business sometime ago. 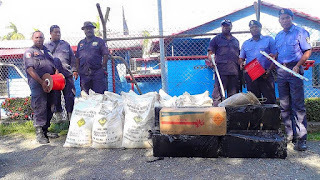 According to Lae Met Supt Anthony Wagambie Jr upon a tip off from a recaptured escapee last week the police intelligence unit carried out investigations and moved into the company premise and removed the explosives. They have confisticated 23 bags of ammonium nitrate, 7 x magnum powder and 6 plastic explosives. Met Supt Wagambie said police are concerned that if they had no use with the explosives, they should have reported it and have them removed and passed onto the relevant authorities.